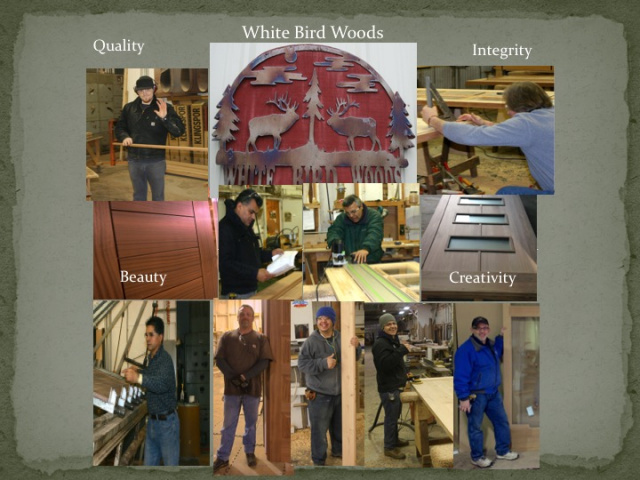 Since 1974, fine woodworking has been the passion and vocation of White Bird Woods owner, Gary Hamm. 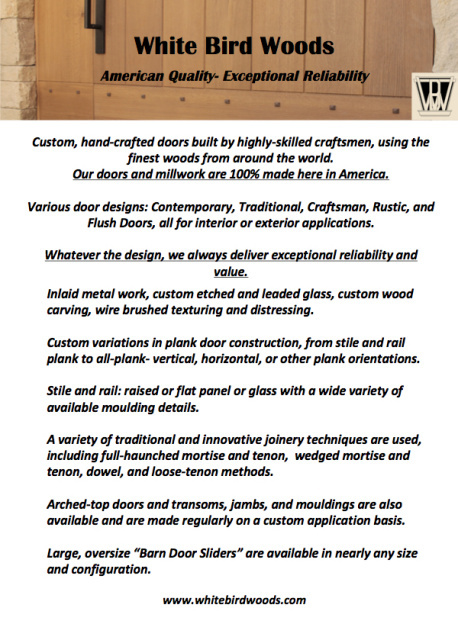 Designing and building custom wood doors is an enjoyable learning experience. Every project has something to teach, and wood's diversity of grain, color, and texture ensure that a craftsman will never tire of creating beautiful, useful, durable items that enhance and add to the character of customers' homes. In the White Bird Woods Mill in Oregon’s Willamette Valley, Gary and his experienced crew build custom wood doors, furniture, cabinetry, mantels and other items. They work with clients to make something especially for them of absolutely the finest quality, made to last for generations. Using traditional joinery methods and a wide variety of domestic and imported woods, White Bird Woods has established itself as a company that adheres to traditional values: quality, integrity, and creativity. If you are interested in beautiful wood, hopefully you will find something here to capture your imagination and spirit. You might want a contemporary or crossover style door or a rustic set of gates. Whatever your design passion might be, please contact us to find out how we can make you something unique that will delight you and enhance your life. Click on the video below to see some of how we construct beautiful, strong, durable doors.